In a Nutshell: In 2012, soon-to-be Harvard graduate Eliot Buchanan was facing the rapid approach of life after college. He needed a business idea that was both useful to users and practical enough to stand the test of time. The answer came to him when he tried to use his credit card to make his final tuition payment, which Harvard rejected citing the high fees charged by card issuers. That’s when Plastiq was born. 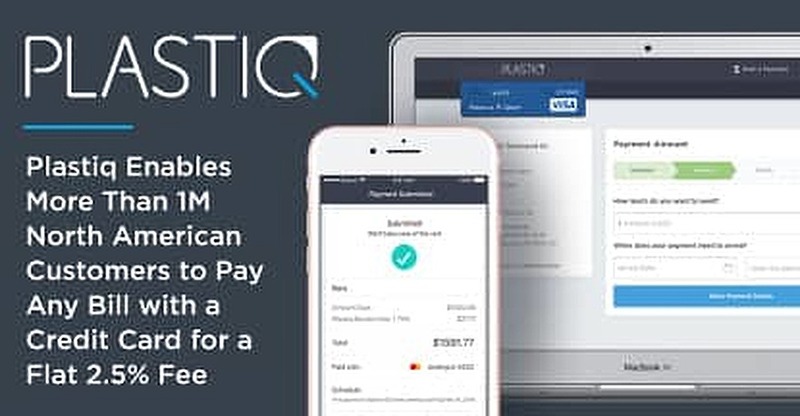 Plastiq — which currently has more than 1 million members in the US and Canada — allows consumers to make payments of any amount using a credit card for a flat 2.5% fee. 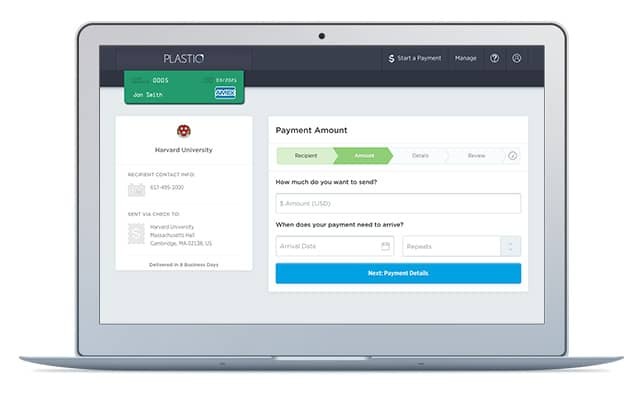 Plastiq processes the payment — which can be made on a desktop or mobile device — and sends the funds either electronically or via a traditional check to the vendor. A referral program allows users to earn fee-free dollars that avoid fees on future transactions. Eliot Buchanan did a lot of thinking during the long flight back from China after an internship he’d lined up there in 2012 fell through. Faced with the reality of losing the internship and the rapid approach of the real world after his upcoming final semester at Harvard, he used his time in the air to kick around business ideas. The bill for his last semester turned out to be the ticket to his future. He wanted to use a credit card to pay for his tuition, but Harvard wouldn’t accept the payment because of the high fees associated with such a sizeable charge. Buchanan thought people who are ready to make a payment should be able to pay in any way that fits their lifestyle. Friend and classmate Daniel Choi agreed and the pair began work on what would become Plastiq. In less than three years, they raised more than $18 million in venture funding and now enables billions of dollars in credit card payments made by US and Canadian consumers each year. While the service is used for various types of transactions by more than 1 million customers, Plastiq’s Head of Marketing, Landon Howell, said the company’s solutions are most useful for larger payments that typically don’t have credit card options. 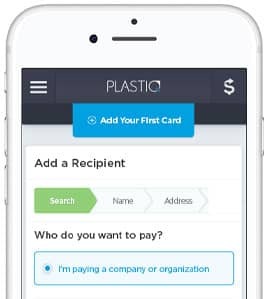 Users who sign up on Plastiq can add a credit card to their account and fill out a form stating who they want to pay and the payment amount. Payments can be made through Plastiq’s desktop website or mobile application for a flat 2.5% convenience fee, with the money sent directly from Plastiq to the vendor— either electronically or via a paper check — in as little as two business days. Payments can be made with credit cards issued in the US and Canada and sent to 157 countries. Transactions have no minimum or maximum limits, as shown through an example Howell gave of a customer who used Plastiq in 2017 to pay a US tax bill of more than $6 million. Customers who use Plastiq to make payments must have a verified account with the company that includes an attached credit card. Vendors accepting payments do not need an account with Plastiq, though having one can decrease the time it takes to get paid. Plastiq’s mobile application allows users to pay bills of any amount using a credit card. Customers can also expedite their payments for a small fee. Howell said further options will eventually be added as Plastiq looks for new and innovative ways to make payments even faster. Howell noted the company has maintained steady growth since its launch but sees a spike each year around tax time in April when US customers use their Plastiq accounts to pay their tax bills. April 30 is the general filing deadline in Canada, and the Canadian Revenue Agency (CRA) lists Plastiq as its only option for debit or credit card payments. In addition to standard consumer bill payments, Plastiq also works extensively with small- and medium-sized businesses to conduct B2B payments. Howell pointed to a San Francisco client who runs a coffee shop as a prime example. The client was approached by the grower of the beans used in his coffee and was offered a 5% discount if he doubled his order size. The client jumped at the chance and used Plastiq to fund the transaction through a credit card. Aside from convenience, another benefit of using Plastiq to make credit card payments for larger expenses is the ability to maximize credit card rewards. Plastiq’s platform helps users reach spending targets that trigger signup bonuses awarded by credit card issuers. Maximizing users’ point, cash back, or travel rewards also allows cardholders to increase their earnings, as well as build a stronger credit history. “Those few hundred or few thousand dollars you spend every month on your rent or mortgage — or the dues you pay to any clubs you belong to — can yield big rewards if you put those expenses on your credit card,” Howell said. Plastiq also conducts occasional promotions that allow users to reduce or eliminate fees on certain transactions. The company’s popular referral program was updated in April 2017 to give users more rewards for sharing Plastiq with their friends. Members earn 1,000 fee-free dollars for every person they refer who signs up and makes at least $500 in payments with the service. The new member also earns 500 fee-free dollars. The credits can be accrued and applied over multiple purchases, eliminating any fees associated with charges up to the amount of fee-free dollars in an account. When Eliot Buchanan hatched the idea for Plastiq in 2012, he figured he’d stumbled on a way to help consumers use their credit cards for transactions that traditionally did not accept charge cards. He couldn’t have envisioned how the platform he created would also improve how customers earn credit card rewards and maximize convenience by allowing them to pay all of their bills on one credit card from a single account. A canceled internship in China during his final semester of college could have been a serious hurdle for Buchanan. Instead, he used the long flights to and from the country to lay the groundwork for Plastiq. Today, more than 1 million users depend on Plastiq to make credit card payments on bills that traditionally reject that form of payment. The steady growth the company has experienced since 2012 is evidence that Buchanan and partner Daniel Choi identified a need in the market and designed a service that makes paying bills and other expenses easier, faster, and more convenient.